This is no ordinary thru-hike. 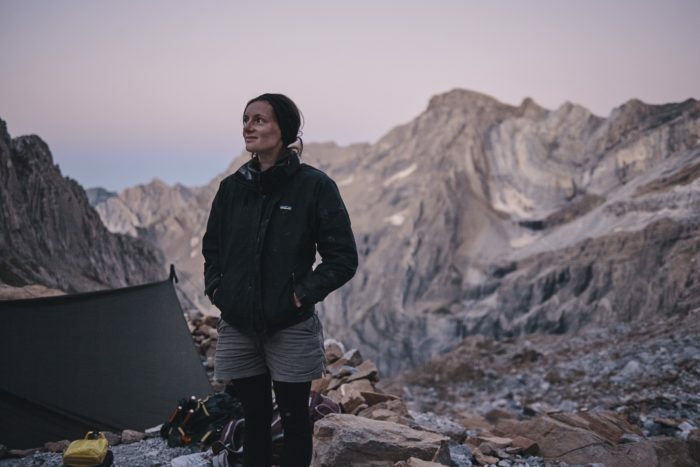 Native Francophones Marie and Nil are lifelong adventurers who set their eyes on something different: a journey across Europe on foot, traversing their own route, and crossing 17 countries over the course of 500-plus days, from Portugal to Turkey. They’ll hike over 10,000 kilometers through four seasons and 120 protected natural areas. We caught them before they set off at the end of this coming January, and here’s what you should know about this incredible trek. Where did the idea for a 10,000-kilometer thru-hike come from? 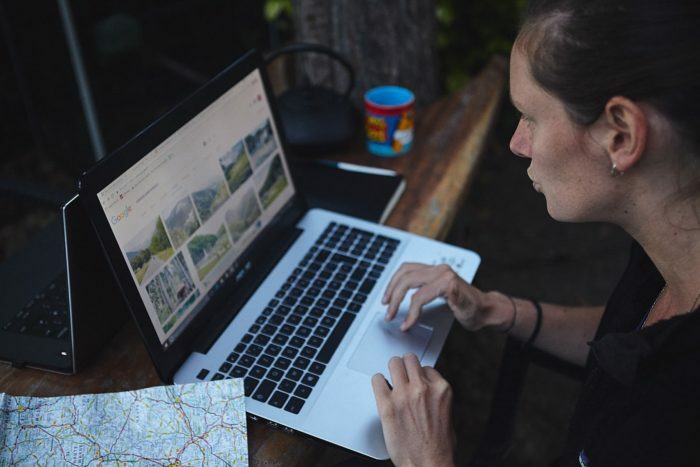 First, we love hiking and traveling—a good start when you plan walking thousands of miles for hundreds of days and across 17 countries and half of the Europeans mountains—but there’s more to it. Deux Pas Vers l’Autre means Two Steps Towards Others. The main reason we decided to undertake such a trip was to meet our fellow Europeans—to learn more about the countries and people around us. The athletic challenge is there, but we are embarking on a human and cultural adventure as well. How did you build your route? 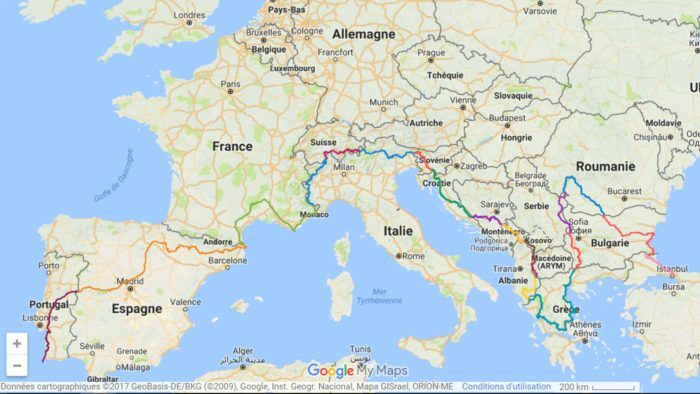 We wanted an inventive and original path, so we used several European long-distance trails and decided to link them with our own routes in order to avoid most of the road portions on the way. Wandermap.net helped a lot on this. It enabled us to find a “Point-A-to-Point-B” itinerary using only the narrowest paths possible to carve your GPS track out of. We will use some major trails like the Via Alpina in the Alps, the Via Dinarica that links Slovenia to Montenegro, plus smaller trails like the Rota Vicentina in Portugal. In the end, we’ll have our original Deux Pas Vers l’Autre trail. And it feels fantastic to be granted so much freedom thanks to the progress in technology. Why did you pick the countries you’ll cross? At some point, we started to feel like we knew more about far-away countries than about our own neighbors. So we thought, “Let’s hike across Europe!” That being said, we both feel a special attraction towards Mediterranean countries. Even if Sagres and Istanbul are thousands of miles apart, there’s this intimate feeling that the people we’ll meet do share, if not a language and a currency, at least a bit of culture and a common character. We did not choose the easy way—thirteen different languages are spoken in those 17 countries. We can speak two of them, plus English. What special gear will you carry? Photo and video equipment is maybe the only point where you guys might think we went totally nuts. We want to edit and publish our videos on the fly, so we need a computer as well as a camera that performs both in photo and video. That’s the trickiest part of this adventure, gear wise. We’ll carry nearly 18lbs of gear, just for that. Yes, we’re aware that could be someone’s base weight. Marie will carry the camping equipment and Nil the tech stuff. Marie’s projected base weight is 22.3 pounds and Nil’s is 34.5 pounds. We’ll really see how it goes once everything is put together. 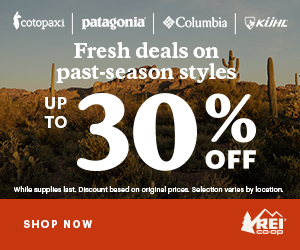 What is your hiking and backpacking experience? Nil: I came to hiking pretty late. Fun fact, it was in Hong-Kong while I was working there. Every day or weekend I had off, I went hiking. When I returned to France, the need for bigger trails grew and I thru-hiked a few GRs (our run-of-the-mill European long-distance trails) ranging from 150 to 400 miles. France provides a wide variety of landscape, terrain, and difficulty, with almost unlimited trails to wander about. Marie: I am not a highly experienced hiker. I actually couldn’t hike for several years because of knee pain. I tried a lot of therapeutic approaches, talked to many doctors, to no avail… until I met my podiatrist. She’s my hero. Since then, I’ve travelled and hiked with orthopedic inserts through many countries. I haven’t crossed that 200-mile bar yet. Your daily budget of 10€ per person isn’t much. How will you make this work? Sticking to €10 a day for our during-thru-hike’ budget is a consideration, even with gear replacement expenses not included. In Europe, prices can vary a lot from one place to the other. From small towns in Montenegro to expensive cabins in the Swiss Alps, the gap is huge. We’ll have to be smart and creative to stick to that principle everywhere we go, and maintain this average that we’ll calculate over several days. This “radical” choice has a double meaning for us. First, €300 per month is less than the average salary in Kosovo, the lowest in Europe. We wanted this adventure to be an experience for anyone, rich or poor, should they feel like giving it a try. Secondly, this choice will drive us even more towards making contact with people, meeting them, asking for help or support as a humble way to learn more about them. How does your family feel about this thru-hike? With mixed feelings. They are proud, but they are worried too. With good reasons, too! We’ll be away from home for at least a year and a half, and we’ll go across some countries that are not very tourist friendly. Some areas in the Balkans are still scattered with landmines from wars in the 1990s and early 2000s. Regardless, our folks know we are reasonable people and they are used to seeing backpacking all over the world for several weeks or months at a time. In addition to a local resident in each country who will tag along for a few days, all our beloved ones are welcomed to join us….provided they’ll be ready to hike 12.5 miles a day! What challenges do you anticipate facing during this trip? To be honest, the only real unknown of the whole trip is winter in the Balkans. It’s a continental climate terrain, and temperatures can plummet drastically during winter. Besides, getting reliable information about trail quality can be quite hard for some countries. Albania, for instance… we should there be around… December? Americans are used to bears, right? We only see those huge hairy beasts on TV in France, or in the Pyrenees mountains. When looking at a picture of a bear playing in the snow in Bosnia, the perspective of meeting him in the flesh is pretty intimidating! 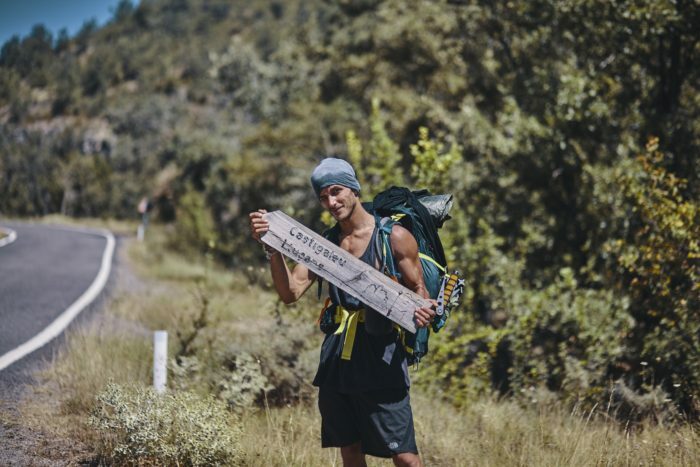 How have you been preparing for this thru-hike? Training for this thru-hike has been quite a roller coaster. Besides our usual sport sessions, we planned four trips of 150+ miles from this past June to next December. Experiencing all different climates, testing our gear and production set-up, overloading packs on hefty climbs to strengthen ourselves. We’ve tried to cover most of the hardest stuff but honestly, over the course of 17 countries, how could we anticipate everything? The Trek has actually been a gold mine for information, in a way. We are very grateful to your community. Lots of articles helped us plan things rarely documented in Europe. We have two more trips planned before the big start, end of January 2018. We’re still gathering the numerous items, bits and pieces of gear set we want to take with us. Besides the physical prep, we spend a lot of time behind our desks. Right now, it’s about building strong relationships with partners and sponsors. We are very happy and honored to announce that the House of Europe in Paris has selected Deux Pas Vers l’Autre as their guest project in 2018 for the European Year of Cultural Heritage. It is a unique opportunity for us and for our partners to get huge visibility across Europe and beyond. How long do you expect this hike to last? Walking an average distance of 12.5 miles a day, we should reach Istanbul in about 550 days, give or take. 12.5 a day is a reasonable basis. The total trail’s length is about 6,850 miles, with total elevation gain of about 1,443,500 ft. It’s actually pretty much similar to the AT as far as elevation-per-distance ratio is concerned. How does this trip fit with your professional life? We have two very different backgrounds, so the answer won’t be the same. Marie had been a human resources manager for years and decided to quit a year ago. Office work didn’t click with her anymore. She’s done with it. Earlier this year, she backpacked a while in Latin America and both of us are now 100% dedicated to planning our project and make it happen. Nil has been a fashion photographer and video director for the past seven years. We intend to produce a lot of content, pictures and video interviews, reportages, logbook and so on. So in a way, he remains in his field of expertise although the topics change! We’ve learnt a lot of things and acquired many skills during preparation, from project management to communication and how to shoot and edit video in tricky situations. We’d love to walk with a local resident in every country—a fellow hiker who can talk to us about the land, and his country’s culture and traditions. If you hail from Portugal, Spain, Italy, Switzerland, Slovenia, Croatia, Bosnia, Montenegro, Kosovo, Macedonia, Albania, Greece, Bulgaria, Romania, Serbia, or Turkey and feel like joining this adventure for a few days, contact us! We’ll be updating as the preparation and trip progresses, and you can follow along on our website, Instagram, and Facebook. Marie: Before embarking on this adventure I was a human resources manager in a huge French company and I am also a Sociology graduate. Understanding and knowing people has always animated me, which is why I chose to make a career of it. As a travel and hike addict since I was a teenager, I usually include long hikes in my trips. However, undertaking such an expedition on foot is a huge challenge for me! Nil: My area of expertise is the visual world, telling stories with pictures. For nearly ten years, I have been working as a fashion photographer and a video director @nil_hope , a job that gave me the opportunity to travel a lot. All over the world, my curiosity always brings me into the most unexpected situations. After a number of autonomous treks and adventures, I felt the need to mix my work with my passion in something bigger, a project towards others. Hello Dami, Thanks a lot for your message! Yes… it is a lot about others, and it definitely makes the best fuel, giving us energy to lead such a project. The route of migrants in Europe has also been something that touched us. Thoughts that were stuck in our heads since the creation of this project. We are grateful for the link and inspiration! We will be following him! what a fantastic project. Marie and Nil, my admiration and envy to you both!! What an inspirational endeavor! May the glorious morning sun greet your every day and a gentle breeze be always at your backs! And most of all, indulge in the joy and wisdom of those other hiker souls who join you on this fantastic journey! I will be eagerly anticipating your updates! We just saw your beautiful message, thank you so much for those kind words! That’s really motivating and this is more than welcome 3 weeks before our departure!! It’s really disgusting that two able-bodied people from one of the wealthiest countries in the world actually PLAN not to have enough money so that they’ll have to ask the poorer people they meet along the way to take up the slack. What’s worse, they make it sound like they’re doing people a favor by “learning more about them”. Well, that’s the Socialist mentality for you. Contemptible! We just discovered your message and this is quite a surprise! This is the first time we get such a virulent reaction. Maybe our english is not good enought to express clearly our toughts or maybe you are not familiar with the cost of leaving here in Europe. Indeed, in most countries it is really doable to leave with 10€ per day especially when sleeping in a tent and travelling on foot. We do not plan to take advantage of “poor people” nor to do them a favor by willing to know them. We intend to meet all kind of people on our way and yes, we think that we will have much more opportunities to meet people by walking and offering our help when something is offered to us than in crossing those countries by car and sleeping in hotels.